The art of up-cycling, deconstructing and re-imagining the book. Books as everyday commodities designed to hold information, are, unless of historical importance more often than not discarded as cultural detritus. Some book artists concentrate on the abstract quality of a book’s shape and its original text may become irrelevant to the final sculptural form. I prefer to take inspiration from the title and subject matter of the book to add an exciting dimension allowing the combination of language and emotion with texture and structure. I think of an ‘altered book’ as one which has been changed and modified by creative means into a mixed-media work of art. I see the book as a tool to explore and communicate ideas in a very individual way. Thus the altered book regains value and becomes a vehicle for the construction of narratives. It may be ‘read’ in an entirely new way. Using scalpels, tweezers and surgical instruments as my equipment, discarded books are lovingly vandalised back to life so they can assert themselves against the culture that threw them away. My work is playful and displays a light witty character but also demonstrates a sense of craft and originality. A passion for craftsmanship is immediately obvious in the attention to detail. In most cases I like to retain the suggestion of the book shape and manipulate the pages by folding and cutting portions of text. I also like to extend the text beyond the confines of the structure. 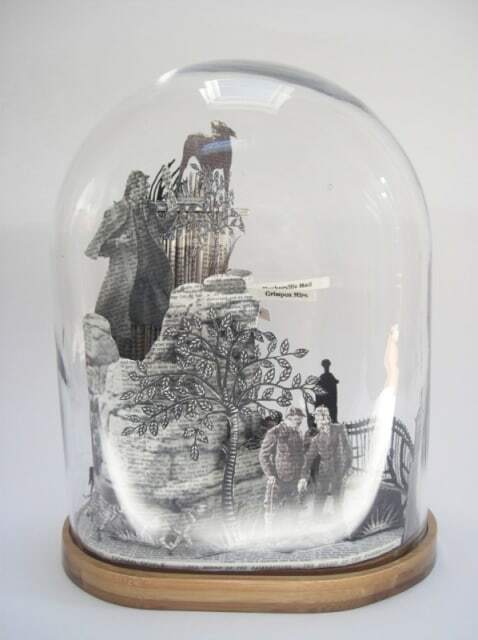 Enclosing the work in a bell jar proposes the book as a singular, precious object, even as mysterious. It becomes an object of curiosity and suggests the idea of a ‘collection’.